I Amsterdam Card – For culture vultures! Neighbourhoods in Amsterdam – Where should you go, and where not? What to do in Amsterdam – Everybody can enjoy themselves in Amsterdam! Museums to Visit With Children – Amsterdam also has plenty on offer for the kids! Madame Tussauds Amsterdam – Meet the stars at the Dam! Bicycle Rental – Enjoy the freedom of discovering Amsterdam by bike! Hop On Hop Off Bus – You decide where to get on and off! 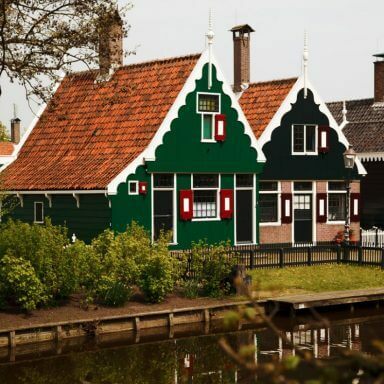 Volendam, Marken & Zaanse Schans – Discover this traditional fishing-village! Ask me your questions and I will respond asap! Do you want to escape Amsterdam for the day and get acquainted with some old Dutch traditions? Then I can definitely recommend a daytrip to Volendam, Marken and the windmills. When you step into these picturesque fishing villages on the banks of the IJsselmeer (lake), it’s like you are entering a completely different world. I have been to these villages before but never really took the time to explore them properly. So I decided I would take a guided tour with someone who could tell me a few facts and see the Netherlands through a tourist’s eyes. Together with a group of tourists I got on a tour bus in Amsterdam which would take us to Zaanse Schans, Volendam and Marken. The tour lasts for just over 5 hours. Zaanse Schans was our first stop, only a few kilometres from Amsterdam. It is impossible to describe the Zaanse Schans in a few simple words. This charming village has stood the test of time and remains almost entirely in its original condition, packed full of old Dutch wooden houses. This trip is both educational and fun. You can do a lot here, as various activities are organised on a daily basis. But even simply walking around the old windmills and drinking in the atmosphere of days gone by is a lot of fun! From the Zaanse Schans our tour continued on to Volendam. Volendam is a popular fishing village with authentic fisherman’s houses. In fact, it is probably the most famous village in the Netherlands. You will find these beautiful old fishermen’s houses snuggled into a jumble of streets; a place of great appeal to painters and artists for centuries. Thanks to the completely isolated location and the enduring vitality of the local fishermen, this village has been able to preserve its lakeside character for six centuries. The typically tiny dwellings, which together with the canals and drawbridges form the most picturesque of spots, offer the lucky visitor an atmosphere of geniality and romance. It is a world away from Amsterdam, but I could quite easily get used to this way of life. 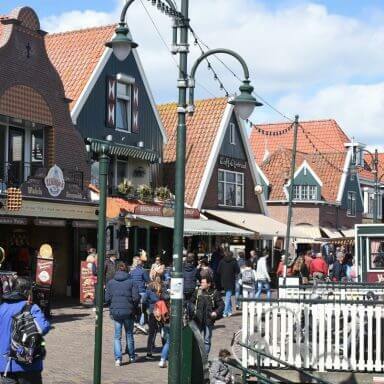 In complete contrast to the city, Volendam is an oasis of peace, despite the fact that it can get quite busy. This fishing village is one of the most popular tourist destinations in North Holland. Tourists come here from all corners of the world to walk across “De Dijk” and through “het Doolhof”, and to eat a freshly smoked eel or two. Het Doolhof (or the Maze) is the oldest part of Volendam. This area owes its name to the fact that its buildings were not constructed along any clearly defined streets. The resulting hotch-potch of houses can also be found in De Oude Kom (the area along the Havendijkje). Enjoy a stroll through the area, but be careful you don’t get lost in the Maze! Buy your tour tickets here! A visit to Volendam should always be recorded for posterity. 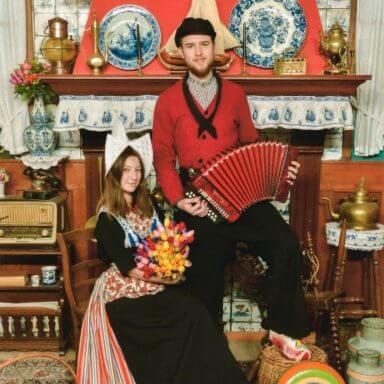 The Dijk van Volendam houses a handful of photographic studios where you can immortalise yourself in traditional Dutch costume, and in a hilarious setting. The set-up is a bit similar to an assembly line, so you will be back outside within a few short minutes, but the result always looks fantastic and I can certainly recommend this special souvenir from Volendam. From Volendam you take the boat to Marken. Marken is a beautiful peninsula and a bit quieter than Volendam. In the 13th century, Marken became separated from the rest of North Holland by a heavy storm. Only in 1957 (on the historical date of 17th October) was a dike constructed to reconnect Marken to the mainland. Marken is famous for its traditional costumes and tiny houses packed full of ceramics and other ornaments. Practically the entire town of Marken has been historically preserved and a walk through it will provide some beautiful picture opportunities! You will come across some stunning sights, such as the Sijtje Boes house, the lighthouse, the drawbridge and the wooden clog factory. I personally think Marken is even nicer than Volendam, because it always feels so small and friendly. What I never knew until I had actually visited Marken was that Marken’s costume is almost a language. The style of clothing is actually a form of communication. You can always tell if someone is in mourning, but here there is also specific clothing for special events. The details on items of clothing can indicate one’s age, while there are outfits for other occasions such as everyday wear, Sunday wear, winter and summer clothing. That’s something we don’t have in Amsterdam! After Marken the bus takes you back to Amsterdam. I loved the experience. The guide was very enthusiastic and it is always fun to take a trip together with people from different parts of the world. Buy tickets for this tour here. A village experience worth checking out. A breath of fresh air and green sights for your eyes! 671 visitors rated Volendam, Marken & Zaanse Schans average 4.58 stars out of 5.